One of the most discussed aspects of owning a laptop and mobile computing, is how to get more operating time from the laptop battery. Everyone needs more time from the battery when they are traveling, or not able to have the laptop plugged into the AC outlet. It seems we always need more time then we get from the battery, and it never fails that we are near the end of a critical task when the screen goes dim. Operate the display at the lowest brightness level that is comfortable for your eyes. The brightness of the LCD screen is one of the main components consuming significant power from the battery. Most laptop and software combination's have control over the display brightness, and this will have more effect on battery time than any other factor. When operating from the AC the brightness can be set at any level you want. An optical disk drive spinning with a CD or DVD inside consumes power even if you are not using the drive for programs. When not using the drive remove the media and you will save power. Using WI FI is a drain on the battery. If you are not using WI FI turn it off and there will be less power consumption since WI FI circuitry even in seek mode consumes power. Remove any unused USB devices. The USB memory stick inserted but not being used is consuming a small amount of power, but when combined with other unused devices increases power consumption. Go to the power options section of your software control panel and select the most conservative or power reducing option available. Select the "Hibernate" option rather than "standby" since hibernate actually shuts the laptop down and saves operating settings. Increasing the amount of system RAM will reduce the number of hard drive accesses because more of the information is stored in memory instead of the hard drive. The reduction in disk activity decreases the power consumed. In addition to the power savings, increasing RAM is the single most significant step other than a CPU upgrade, that you can take to improve speed and performance of your laptop. If you take care of the battery it will provide longer more reliable service. Remove the battery periodically and using a pencil eraser clean the contacts, and using a cloth or cotton swab moistened with rubbing alcohol clean the battery contacts. Don't leave the battery in the direct sunlight or store it where it will be subject to high temperatures. 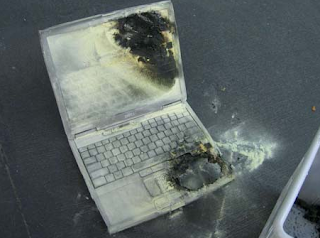 Heat is the enemy of electronic components, and that includes your laptop battery. Depending on the type of battery your laptop uses you should charge and discharge the battery every two weeks. Check the operating manual to be sure of this procedure. You should not completely discharge a LI-ION technology battery since it doesn't have the same "memory" effect as non LI-ION type batteries. Most new laptops use LI-ION batteries but check your manual to be sure of the correct care of the battery after periods of non use. Following the simple steps outlined will go a long way towards getting more operating time from your laptop battery without hampering your laptop use. Computer service industry professional who focuses on providing information on computers and consumer products.